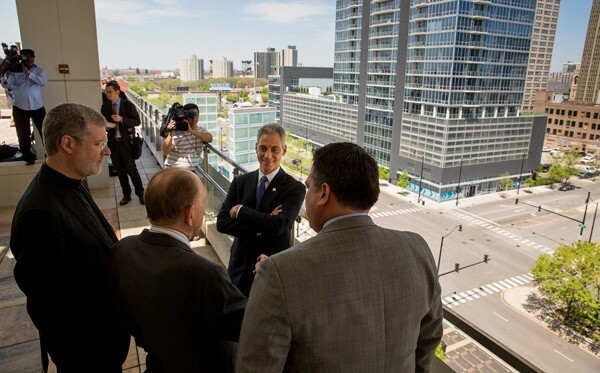 Mayor Rahm Emanuel and other officials eye the proposed site of DePaul's publicly subsidized basketball arena. As my libertarian friends might put it, the mayor is crippling capitalism by intervening in a free market. Quick—tell the people at the University of Chicago who worship at the shrine of Milton Friedman, their beloved free-market guru. Oh, wait—the University of Chicago has its own hand in the TIF cookie jar, as it's counting on public funds to subsidize a deal for a Hyatt Hotel on 53rd Street. To paraphrase Mr. Friedman: lunch is always free, so long as the taxpayers pick up the tab. And what do you, the taxpayers, get for this $55 million? You get a hotel that you'll probably never stay in. And an arena for DePaul basketball games that you'll probably never attend. Because let's face it—there are even fewer fans of the Blue Demons in this town than of the White Sox, who also play in a subsidized facility that doesn't often fill up. Since the deal costs $55 million, we'll have less money to spend on schools. Which means most of them will still go without music, art, drama, intramurals, or reduced class sizes. At this point, I should remind everyone who doesn't know that DePaul is a private university with tuition costing more than $30,000 a year for undergraduates. That means it's a long shot for average Chicagoans, unless they're willing to go into severe debt to pay for it. It's also a Catholic school. I mention this because it ties in with another of my favorite topics: the curious attitude of the mayor and his allies toward Catholic institutions. Earlier this month, Cardinal George joined forces with rabbis, imams, ministers, and priests to call on Mayor Emanuel to bring back the water fee exemption he stripped from nonprofits, including soup kitchens and shelters that serve the poor. In response, the mayor's City Council floor leader, Alderman Patrick O'Connor, ripped into Cardinal George, telling him to mind his own business. What this all means is that Catholics who serve the poor should shut up, while those who serve well-off suburban kids are rewarded with money for a basketball arena. This might be an interesting topic of discussion in a theology class at DePaul or Loyola University, which received its own $50 million or so in TIF funds a few years ago. I'll also note that a little more than half of every TIF dollar—in this case roughly $28 million—comes from the Chicago Public Schools. So there's always a chance that the board of education—which is charged with looking out for the fiduciary health of the schools—will use its clout to try to kill this deal on the grounds that there are better ways to use $55 million. At the very least it's something to think about as the mayor's appointees say they have no choice but to close the schools. Politicians making a buck on their offices is nothing new here. Mayor Rahm basks in the glow of his great TIF triumph—taking millions from bankrupt schools and wasting it on his DePaul/Marriott boondoggle. As principals warn their staff of budget cuts in the public schools, Mayor Emanuel takes another step to spend $55 million in property taxes on a hotel and DePaul University basketball arena. Mayor Rahm's school board takes a big stand! Chicago's school-closing board once again proves it's a wholly owned subsidiary of Mayor Rahm. Rahm made himself scarce as his education aides finalized the plan to shutter 50 schools. Looks like Governor Quinn will have to save us from Mayor Rahm—again! Let's add Governor Quinn's name to the long list of people Mayor Rahm won't talk to.